The St Laurence Church schools were founded in 1714 by Dr William Worth, Rector of Northfield. They are thought to be the oldest church schools in Birmingham. Since that time the schools have provided a Christian education for the people of Northfield and surrounding parishes. In many local families, several generations have attended the schools. 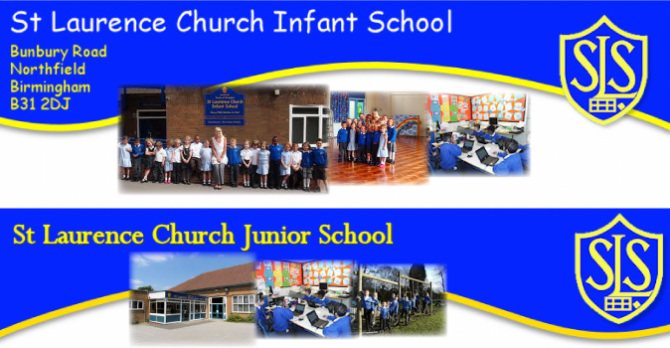 The local St Laurence Church Infant and Junior schools are voluntary aided. "have a strong sense of Christian purpose, which is reflected in relationships, worship and general school ethos. The majority of the Governors are representatives of the Church of England, and traditionally have had greater responsibility for the management of the schools than other Governing Bodies. They are responsible for admissions to the schools, determine the nature of the religious teaching and worship, and decide the general curriculum pol​icy for the schools." If you have a child for whom you will be applying for a reception place based on church attendance you will need to sign the register at the back of church regularly as evidence of regular attendance. It is also important that the form for each child is completed and returned to the Churchwardens so that the signatures can be verified. If you have any questions please speak to Roy or Debbie.